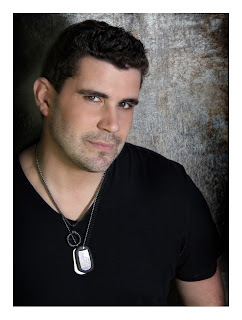 I had been looking forward to interviewing former Marine, Josh Gracin about the “Rockin for the Troops” concert in Wheaton IL on July 16th and now the words of Josh's “I Want to Live” were speaking to me personally as my son lay ill. A song writer and performer’s skill to talk with others and tell their story touches the human race. Josh Gracin will sing a song about an American hero’s story after choosing a winner from many entries that touched his heart during the Portraits of Heroes Song Contest. The interview was one of modern technology with the Sears public relations firm, Euro RSCG Worldwide PR coordinating with Josh, as he traveled through West Virginia to talk to me as I sat in Centennial Hospital in Nashville. The sergeant’s story will be told in song after Gracin and Arrechaga’s widow met in Nashville to collaborate and discuss the project. Josh said that Seana wanted the song “to help everyone” and he wanted it to have a universal appeal as well. The song captures the emotions of a woman who lost so much but wants to help others! That is service before self and really captures the heart of America’s military spouses. Josh said that he is looking forward to the concert to debut the song, “I Will Not Say Goodbye”. He said that the Sears Heroes at Home program was “amazing” how it helped veterans re-model, upgrade and make their homes disability friendly. Dan is doing better and so are America’s heroes as they are cared for and get the opportunity to feel appreciated! Thank you Josh and Sears for making this happen! If you would like to support this program please go to Heroes at Home! They are looking for volunteers, gifts and your support. Active Kids are Happy Kids - Summer Fun! "Too Sweet a Deal"? You Decide!